Military system was a big difference between the Roman and early Chinese Empires. A peace-time standing army, some 300,000 strong, mostly life-time professionals, was a peculiarity of the Roman Empire. A pillar of the empire, it also became a source of political instability, as officer cabals gradually developed a taste of hailing their own emperors. The Qin and Former Han Dynasties, like the Roman Republic, depended on conscription. Rotating draftees serving year-long tours filled the main army when military needs arose. With their better developed civilian bureaucracy, the court had better control of the army. 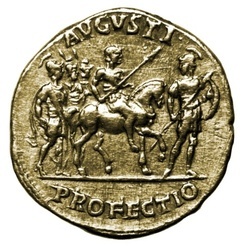 Coin issued by Trajan in 115 CE, the year he reached the Persian Gulf. Trajan personally led the army in conquering Dacia and Mesopotamia. After his precedent, Roman emperors were obliged to campaign in person. When hostilities erupted in several fronts, the inability of the emperor to be everywhere often prompted usurpers. 2. A tally for commanding troop movements. 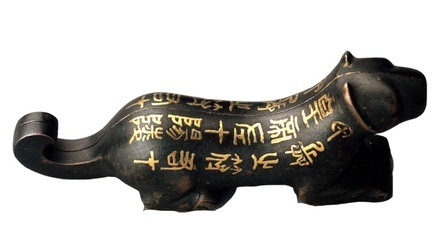 A tiger-shaped tally by which the First Emperor moved particular units, this one for the troops in Yangling. The inscription says: “Military tally. The right side stays with the emperor, the left side stays in Yangling.” The troops obeyed commands only when the two matched sides combined. Such tallies had been in used since the warring-states period. Infantry was always the main force of the Roman army. It displaced chariots on Chinese battlefields since the warring-states period. A legionary of the first century BCE, armed with javelin, sword, and shield. 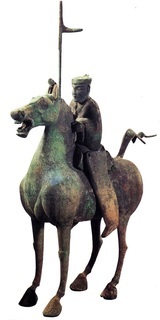 A Qin infantryman, probably holding sword and halberd. A dagger and a sword in the style of gladius hispaniensis or Spanish stabbing sword, on which Roman legionary swords were based. 4. Weapons for Qin's infantrymen. 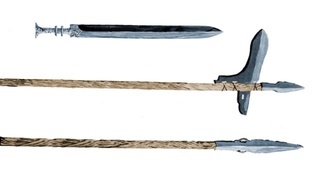 Drawing of Qin weapons: a sword; a halberd, and a spear. The halberd was the favorite. 5. The Roman tortois formation. Fighting with locked shields, which required great cooperative discipline, was a characteristic of the Greco-Roman army. 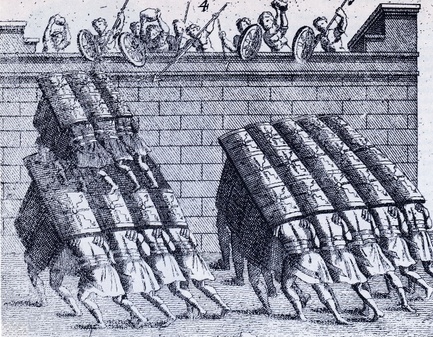 A supreme expression was the Roman testudo (tortoise) formation that protected soldiers from missiles. The picture illustrates its use in attacking a fort. 6. A terracotta soldier with crossbow. The crossbow was a favorite weapon of the Chinese infantry. Drawn with the help of legs, it was stronger than arm-drawn bows. Its mechanical trigger increased accuracy. Requiring less skill, it could be deployed en mass, which compensated for its rather low firing rate. (Museum of Roman Civilization, Rome). 9. A Roman crushing a Gaul. 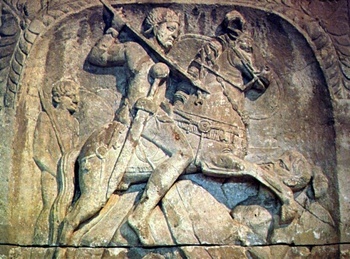 Sarcophagus relief of a fourth century cavalry general in Gaul. 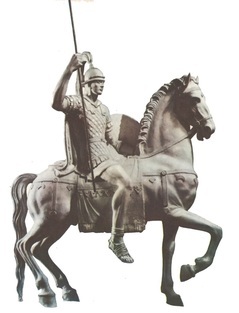 Auxiliaries made up the bulk of the Roman cavalry. Like contemporaneous Chinese, the Romans lacked stirrups. 10. The Parthian shot in China. 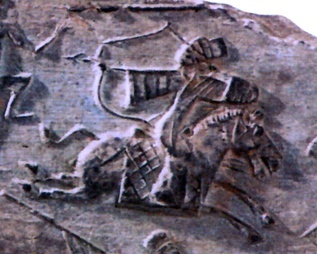 Detail of a Latter Han tomb relief showing a Chinese horseman executing what the Romans called the “Parthian shot”. 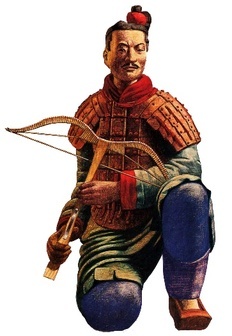 Wars with northern nomads prompted the Chinese to practice mounted archery. Battle scenes appear in Roman artworks of all kinds, as they receive thick descriptions in historiography. In contrast, they are rarely found in Chinese art and historiography. 11. 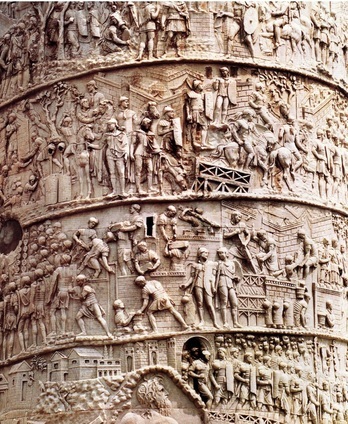 Details of Trajan's Column. Details from Trajan’s column and the column of Marcus Aurelius. 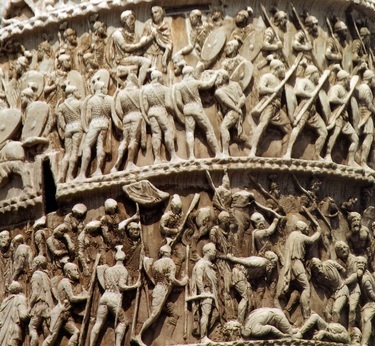 Besides fighting and killing captives, the triumphant columns also show soldiers engaging in constructive activities. 12. 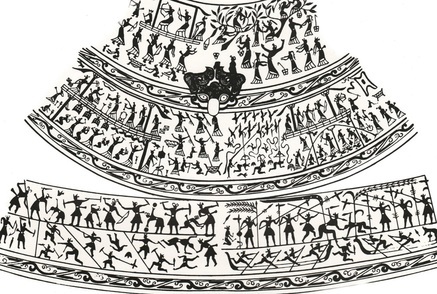 Warring-states vessel showing battle scenes. 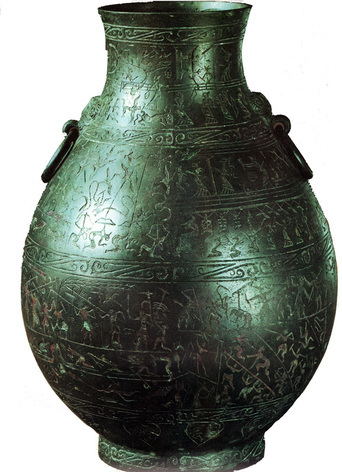 A bronze vassal of the warring-states period depicts hunting, music playing, and other daily activities on the upper part, and on the lower, land, river, and siege warfare. Rome’s large professional army constituted a world of its own. Its basis on the northern frontier seeded major European cities: Cologne, Bonn, Mainz, Vienna, Budapest, and Belgrade. The Chinese northern and northwestern frontier was in more desolate terrains. It defense relied more on civilian settlers and militia. Even garrison troops were often accompanied by families. 13. A Roman fort defending Cologne. Model of Fort Deutz defending Cologne, which became a military base in 50 BCE. 15. The ruins of Roman fortress. The foundation remains of a legionary fortress at Caerleon, South Wales. Serving the barracks are networks of waterworks and latrines. 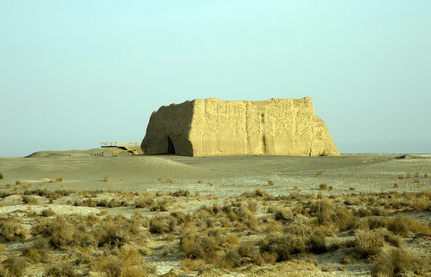 Remains of the Jade Gate, which is deserted even by modern tourists of the Silk Road. 16. From the life of garrisons on the Silk Road. 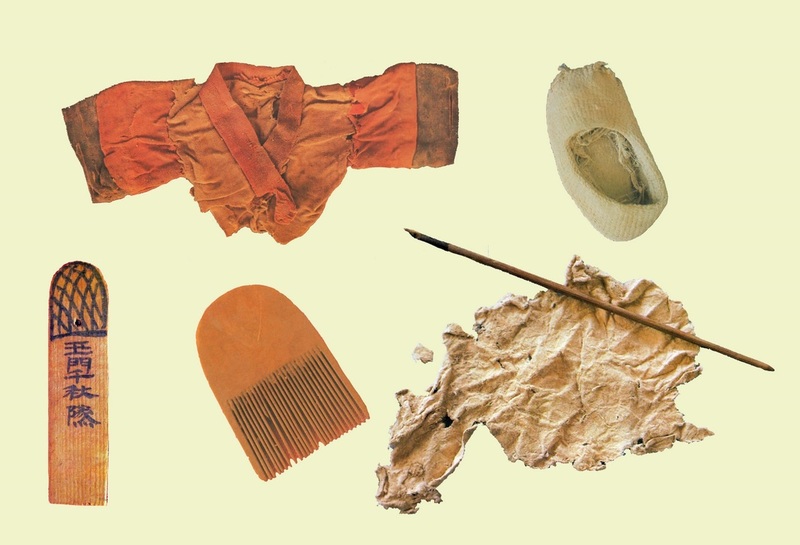 Items recovered from the site of a Former Han beacon tower 95 km from Dunhuang: A doll’s garment, a child’s shoe, an identification tag, a comb, and a piece of flax paper with writing brush. 17. 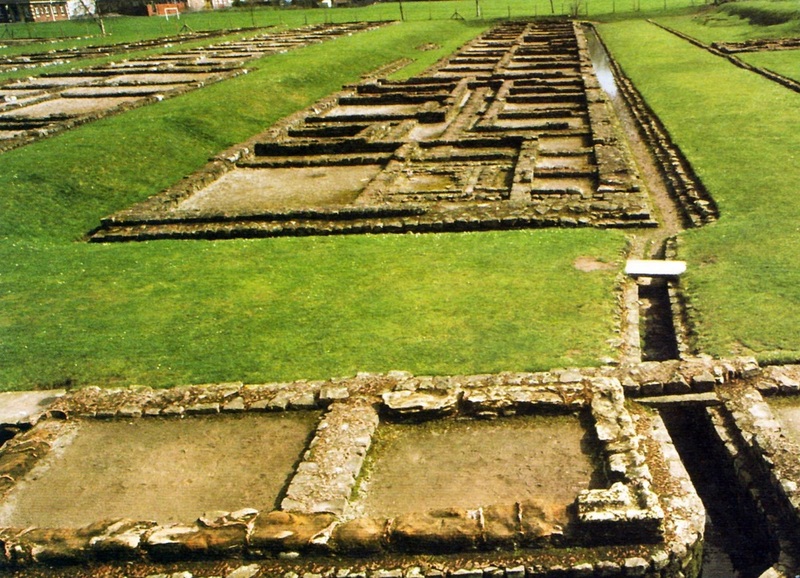 A legionary camp on the Hadrian Wall. 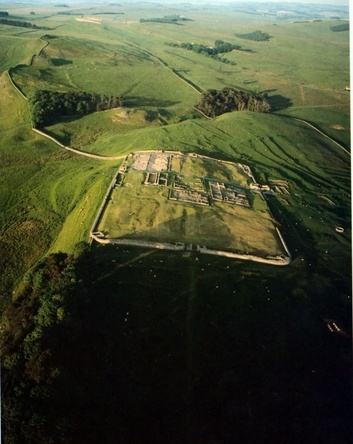 Aerial view of Hadrian’s Wall at Vercovicium in Britain, with a fort attached to its south side. (Jason Hawkes). 18. A farmer-soldier camp on the great wall. Arial view of the First Emperor’s wall in Guyang, Inner Mongolia. Its height and width are puny compared to the familiar Great Wall built in the Ming Dynasty (1368-1661). 19. A Roman defensive wall. 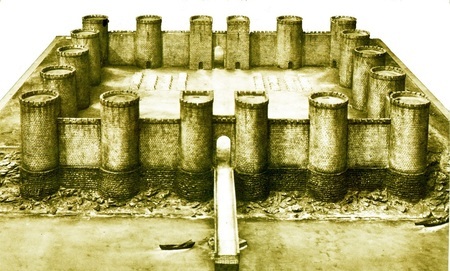 Roman defensive walls were usually built of stone. 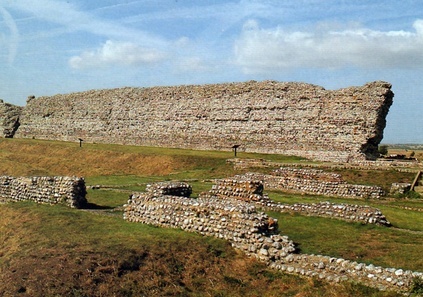 This third century wall at Richborough, Britain, also used cement. 20. A Han defensive wall. 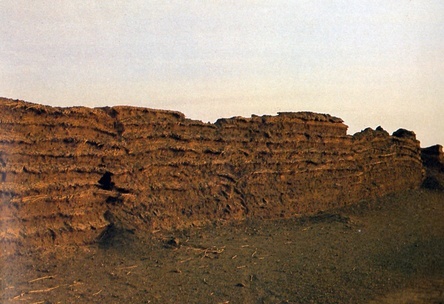 Early Chinese walls were usually built of stamped earth. This Han wall also used locally available reeds and twigs.